When two creative people dwell, ordinary apparatuses just won’t do. 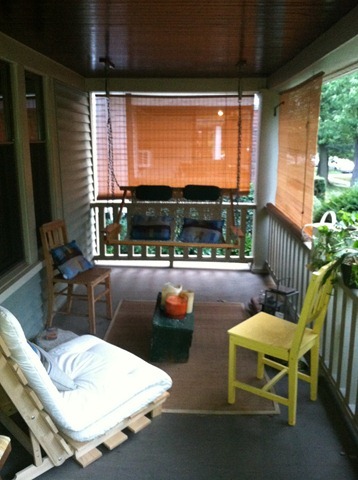 And when you have a stellar porch (see below) sans outlets, your lighting techniques have to get a little creative. Luckily, Ricky merchandises occasionally at Crate&Barrel and so a large quantity of over-priced, gorgeous goods find their way into the Haus de Sticky, beeswax candles included. He’s also superb at finding and posting great craft projects – thus our recent acquisition of him into Craft+Wine Club – most especially these DIY lantern as sourced from StumbleUpon. 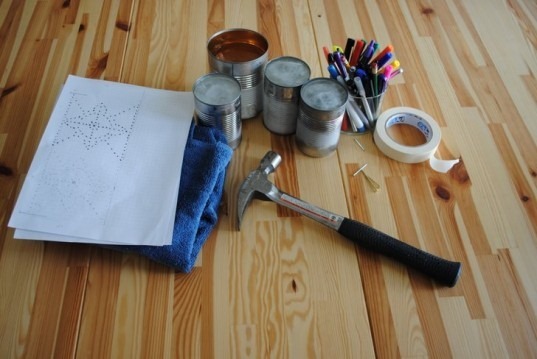 I wouldn’t necessarily call this project ‘easy’, although you will certainly be able to find all of the necessary objects in your home (tin cans, hammer, nail, ice, paper, pen, towel, tea lights (LEDS for a children-safe alternative). 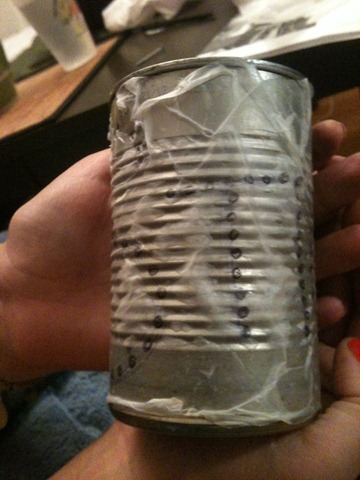 The difficultly lies in actually puncturing the tin (maybe we buy sturdier stock than the fine folks at Stumble?) and so a little bit of force multiplied by one billion holes could have you feeling as though you’ve done a few too many bicep curls. Also, the noise isn’t too pleasant – not exactly a sit-and-watch-a-movie activity. Nonetheless, it was a fun project completed in less than an hour and with tea lights burning inside, created great light sources for our party earlier this month. 1. 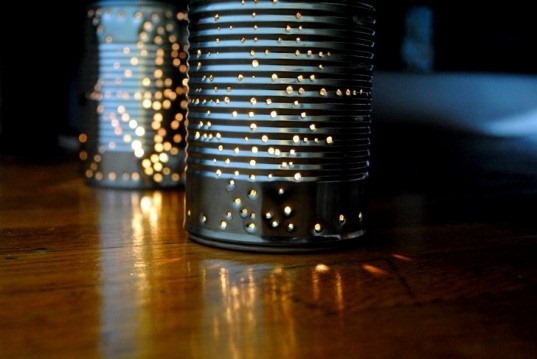 Acquire your tins, thoroughly wash and fill with water to the brim. Freeze. We had a bit of difficulty with the cans’ bottom rounding out due to expansion, but were able to tap them back into shape with a hammer. 2. What 24 hours. Cut a piece of paper to height and length and dot a pattern. Over the course of a few of these, we found that both a few holes and many holes and a precise or a random pattern result in different but similarly magical effects, so the choice is yours. We also used tracing paper in lieu of printer paper which was admittedly a poor choice, since the paper was plain soaked two minutes in. I imagine this would happen to printer paper, as well. Maybe we were just too darn slow! 3. Hammer time, baby. The towel is supposed to catch ice chips, but I think its most useful role is protecting your table surface. Make sure not to do this one on a glass coffee table! I actually used my lap, above, for fear of damaging an antique table! 4. Your ice will likely slide out prior to you completing your craft. Or at least this was our experience, working in what must have been greenhouse conditions the way these chunks melted! It’s perfectly okay if you still have holes to punch and your ice is dwindling to cube size. The tin does slightly deflect when hit sans ice chunk, but no major damage will be endured! 5. Lights. Grab your camera. Get ready for some lighting action. We used tea lights because they are cheap and plentiful (do they always come in quantities of 100?). I own some LED tea lights and they would work just as well and be safer depending on the flammability of your porch / the clumsiness of your porch-mates! DISCLAIMER: THIS CANDLE LIT MY DRESS ON FIRE. but it’s fabulous anyway.